​DAY AND NIGHT CRUISES TO CHOOSE FROM! Chicago's BIGGEST. St. Patrick's Day Party! ​DOORS OPEN TO PUBLIC AT 12PM! ​Early Bird Discounted Tickets On Sale Now! Early Bird Discounted Tickets On Sale Now! 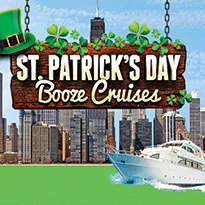 Chicago's Best St. Patrick's Day Events! from ChicagoStPattysDay.com on Vimeo.